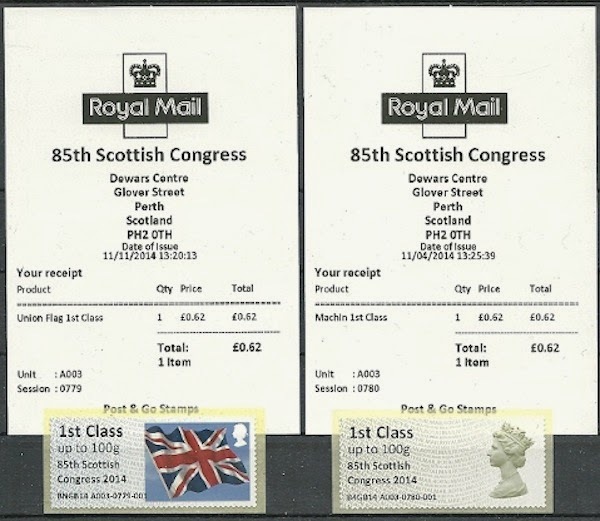 When the Royal Mail Post and Go machines went to the 85th Scottish Congress at Perth, another software error occurred on machine 3 resulting in the date showing as November instead of April. As readers will know we didn't get any stock of the Perth Congress stamps. Thanks to Joachim we can now show a scan with the last stamp with string BNGB14 (session 779; time 13:20:13) and the first stamp with string B4GB14 (session 780; time 13:25:39).